Pakistan’s Chief of Army Staff, General Ashfaq Kiyani, the country’s senior military leader, has appointed a new Director General of Inter-Services Intelligence or I.S.I., the Army’s main spy agency, notorious in the United States because of its long collaboration with Islamist militants, including the Taliban. Lt. General Ahmed Shuja Pasha succeeds Lt. General Nadeem Taj, who had been appointed by former President Pervez Musharraf. The leadership change is part of a much broader shakeup of senior assignments in the Pakistan Army involving fourteen or more new promotions and senior commands. The main theme of these appointments is an assertion of greater direct control by Kiyani, who succeeded Musharraf as Army chief late last year. In addition to Taj’s removal at the spy agency, the two-star generals at I.S.I. in charge of liaison with Islamist groups and with internal Pakistani politics, Asif Akhtar and Nusrat Naeem, have been “superseded,” or denied promotion. These changes mean Kiyani and Pasha will install their own generals in the critical operations jobs. Pasha is well regarded at the Pentagon. He has attended all six of Kiyani’s meetings with the U.S. Chairman of the Joint Chiefs of Staff, Admiral Mike Mullen. In these and other meetings with American interlocutors, he and Kiyani have described and defended their approach to their war against the Taliban, according to the accounts I have heard of the meetings. The Pakistani generals have said that they are seeking a politically acceptable military solution to the challenge posed by the Taliban, and are anxious to see the new Pakistani civilian government in Islamabad, led by President Asif Zardari, offer more political support and cover for what is an unpopular war. 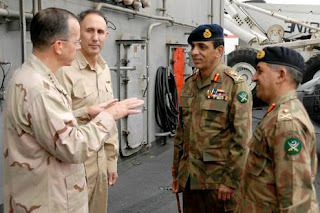 The Pakistani generals have described themselves as searching for the optimal blend of military, political, and economic approaches to the conflict, and they have emphasized the need to maintain and raise the morale of Pakistan soldiers as they wage a campaign that many of their fellow citizens regard as illegitimate. Late-breaking news from Pakistani media, which, if true, may make the Army’s campaign slightly easier, at least in the short run: Baitullah Mehsud, the leader of the Pakistani Taliban, has apparently died from natural causes. Pakistani authorities accused him of ordering Benazir Bhutto’s murder. I spoke about the I.S.I. leadership changes today with Shuja Nawaz, an expert on the Pakistani Army; he is the author of “Crossed Swords: Pakistan, Its Army, and the Wars Within,” published by Oxford University Press. He told me that he met with Pasha in July during a research trip to Pakistan, and that during their conversation, Pasha described “an internal debate within the Army about the need to reorient the Army toward counterinsurgency” in order to fight the Taliban. “He indicated that it was not a finished debate yet.” Nonetheless, under Pasha, who was then Director-General of Military Operations, the Army had begun for the first time to provide counterinsurgency training to officers and troops headed off to fight in Taliban territory in the country’s West. “He’s very solid militarily,” Nawaz told me, speaking of Pasha. “He’s quite close to Kiyani and I suspect he will be able to exercise much greater control down to the contractor level” of I.S.I., which is the operational level where former military officers and other contractors in the spy agency have the closest interactions with Islamist clients. Pasha’s career has been based in the infantry. He served abroad in peacekeeping operations in Sierra Leone. For the past several years, he has held the main day-to-day war-fighting job in the Army; in that capacity, he has worked closely with Kiyani on counterterrorism campaigns. We’ve heard declarations about I.S.I. reform before, of course, and they have not led to meaningful change. An essential problem has been that Pakistani generals have not seen the Taliban as an unmanageable threat—certainly not a threat to their country’s “existence,” as General David Petraeus described it the other day while on a visit to London. Do Kiyani and Pasha really see the current threat equation differently? Is he prepared to give up or at least seriously diminish the use of Islamist militancy as an instrument of Pakistan’s foreign policy, particularly against India and Afghanistan? If so, how much drive and ability will Kiyani and Pasha display as they attempt to force I.S.I. to abandon its history of collaboration with the Taliban and other Islamist groups? Arguably, there are few more important questions these days in American national-security policy.